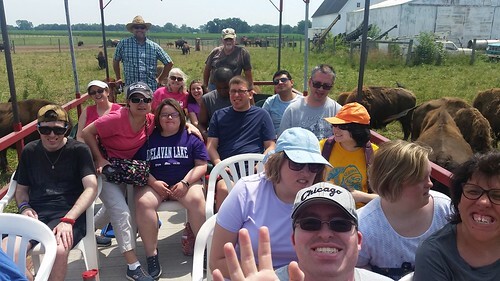 EAGLES is a community-based program that incorporates therapeutic recreation to help adults ages 18-50 with developmental disabilities Enhance Adult Growth through Lifestyle Education and Service. This program emphasizes leisure independence, community outings, and social interaction with peers. Each day includes a physical fitness component, guidance in making healthy choices, a recreational activity, and lunch. Foster and improve independent living skills. Improve physical and mental health through community-based recreation. Increase self-esteem by participating in community service projects. All EAGLES sites offer a computer lab, full kitchen, and smartboard, and are wheelchair accessible. They also provide access to indoor and outdoor swimming and fitness centers, plus additional site-specific amenities. Just a few examples of EAGLES activities include animal assisted therapy, yoga, gardening, swimming, exercise, dance, volunteering, health education programs, an annual 5K, and trips throughout the community including movies, plays, sporting events, and bowling, plus so much more! Check out photos from the EAGLES’ adventures in the gallery below, or view the photos on Flickr! The EAGLES program is offered Monday-Friday, and participants can register for Monday/Wednesday/Friday or Tuesday/Thursday schedules. The program runs daily from 9 a.m.-3 p.m. Before and After Programs are also available for an additional fee, and are designed to be unstructured time for participation in self-led activities. Staff are present for the duration of the Before and After Programs. EAGLES is designed for individuals who can perform on a 1:6 staffing ratio. Download the EAGLES brochureClicking this link will open a PDF document. to learn more about participant expectations, fees, and additional program details. EAGLES holiday dates are also included in the brochure and on our Event Calendar. For more information about the EAGLES program, please contact us online or call us at 630.960.7600.